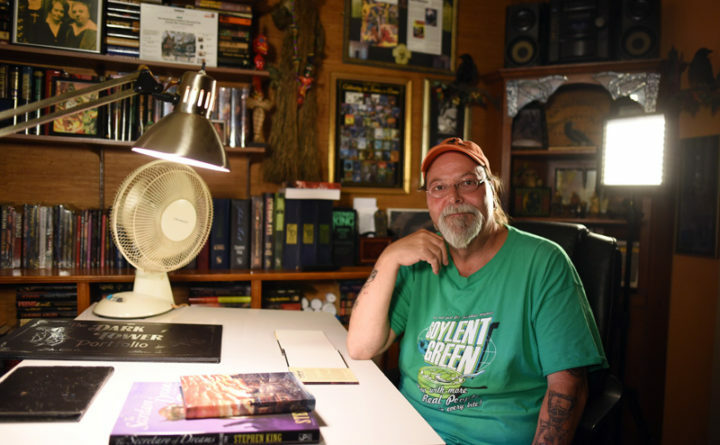 Artist Glenn Chadbourne sits in his home office in Newcastle, surrounded by books he has illustrated, including many by famed horror author Stephen King. A filmmaker interviewed Newcastle artist Glenn Chadbourne for a documentary about blockbuster author Stephen King. Chadbourne has illustrated countless stories over the years and began working with King in 2005. He has been The Lincoln County News’ editorial cartoonist for more than 30 years. Chadbourne said Elephant House Studios of London, England, reached out to him in July, saying they wanted to have him in the film. The working title of the film is “The Shocking Life and Work of Stephen King,” according to director and producer Elliot Kew. Kew said he thinks Chadbourne’s work is fantastic, and would be a great addition to the film. Kew interviewed Chadbourne in his Newcastle home, where he grew up and has lived for most of his life. He now lives there with his wife, Sheila, and their dog, Evan. He showed Kew his office, which is filled to the brim with books and illustrations, many featuring the undead and other ghoulish subjects, favorite topics for both King and Chadbourne. Chadbourne said he has been drawing for most of his life, and being an only child gave him plenty of time to be creative. “I always just drew,” he said. 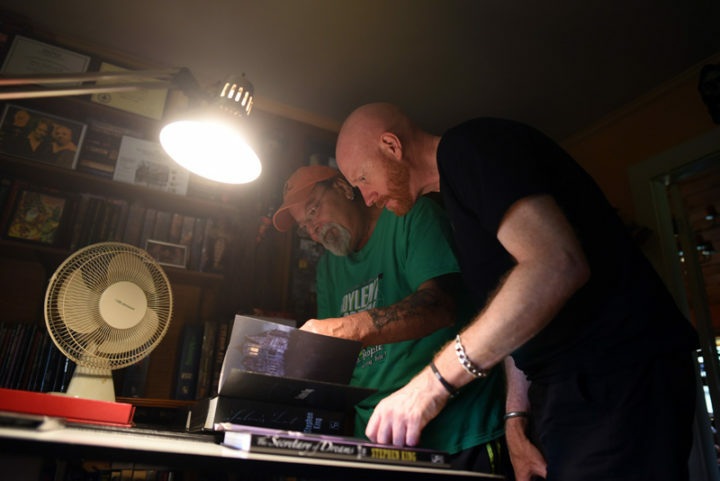 Artist Glenn Chadbourne shows producer and director Elliot Kew some of his work on Stephen King projects during the filming of a documentary on King's life and work July 30. Chadbourne said he has been a fan of horror books and movies since childhood, and even wrote a book report on King’s “Carrie” in high school. After graduating from Lincoln Academy, Chadbourne attended The Portland School of Art, as well as the University of Southern Maine and the University of Maine at Augusta. Chadbourne recently had the opportunity to illustrate a collector’s edition of “Carrie,” years after it influenced the artist in his teens. Chadbourne said he feels very lucky to make a living as an illustrator. “I get to do what I love,” he said. In his office, Chadbourne has framed holiday cards from King, which he asked Chadbourne to draw for him. One card, which features an undead couple kissing under mistletoe, is inscribed with “Happy holidays to my favorite artist!” in King’s looping handwriting. 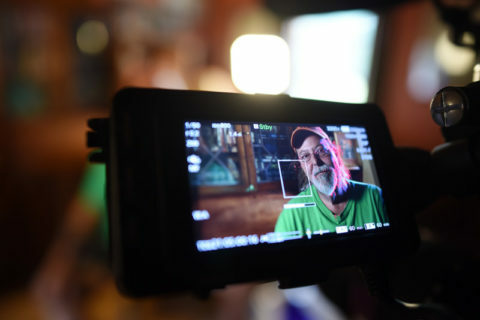 Artist Glenn Chadbourne, as seen by the video camera during the filming of a documentary on Stephen King's life and work July 30. Kew asked Chadbourne questions about his work, and why he thinks King’s work is as popular as it is. “It stays with you,” Chadbourne said of King’s work. Kew said they have been filming for about two weeks and will be traveling for about six or seven more weeks to complete the interviews for the documentary. After filming in Maine, Kew will travel to Los Angeles to interview actors from film adaptations of King’s novels, such as Nancy Allen, who played Chris Hargensen in “Carrie” in 1976. The film is scheduled to air around Halloween on Channel 5 in the United Kingdom, and will be sold worldwide on DVD.